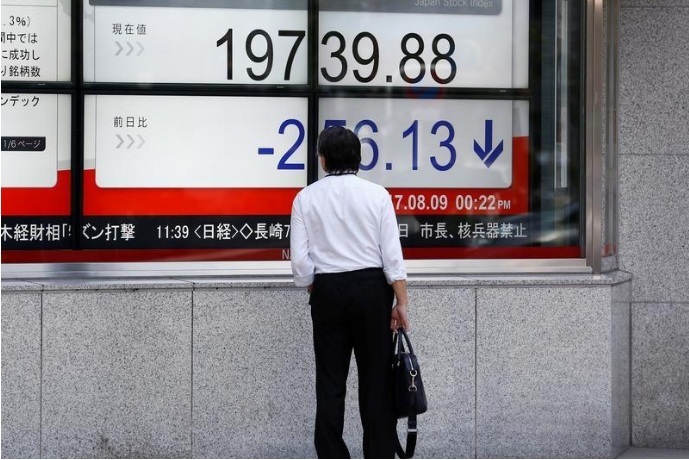 FILE PHOTO: A man looks at an electronic board showing Japan's Nikkei average outside a brokerage at a business district in Tokyo, Japan August 9, 2017. TOKYO - Asian stocks fell and the Japanese yen and Swiss franc gained on the mooted possibility of North Korea conducting another hydrogen bomb test, this time in the Pacific Ocean. MSCI’s broadest index of Asia-Pacific shares outside Japan .MIAPJ0000PUS handed back earlier gains and was down 0.4 percent after falling 0.7 percent the previous day. The index had risen to a decade high on Tuesday, lifted as Wall Street advanced to record levels before falling back after the Fed heightened expectations for a third interest rate hike this year. Japan's Nikkei slipped 0.2 percent and Australian stocks advanced 0.2 percent. South Korea's KOSPI fell 0.5 percent on the latest bout of geopolitical tensions. Shanghai was down 0.5 percent after S&P Global Ratings downgraded China's long-term sovereign credit rating on Thursday, less than a month ahead of one of the country's most sensitive political gatherings, citing increasing risks from its rapid debt build-up. The dollar fell 0.3 percent to 112.140 yen, pulling away from a two-month high of touched on Thursday 112.725 when U.S. yields spiked on the back of the Fed's hawkish stance. Safe-haven gold ticked up, with spot prices up 0.2 percent at $1,293.70 an ounce, after marking its lowest since Aug. 25 at $1287.61 in the previous session on a firmer dollar. The S&P 500 lost 0.3 percent, snapping a four-day winning streak. The Dow fell 0.25 percent and Nasdaq dropped 0.5 percent on Thursday as the U.S. equity market braced for a third interest rate hike this year. The United States ordering new sanctions against North Korea was also seen to have weighed on Wall Street. In currencies, the Australian dollar was down 0.2 percent at $0.7917 after sliding 1.2 percent the previous day. The Aussie was hurt on Thursday when Reserve Bank of Australia Governor Philip Lowe said that the central bank does not have to follow a general move globally to raise interest rates. A sharp drop in the price of iron ore, Australia’s main export commodity, to a two-month low, has also weighed on the currency. Crude oil prices were little changed amid a wait-and-see mood as ministers from the Organization of the Petroleum Exporting Countries, Russia and other producers meet later on Friday to discuss a possible extension of the 1.8 million barrels per day (bpd) of supply cuts to support prices. While many analysts expect an extension of the deal beyond next March, a number of them noted that prices have risen high enough to tempt countries to boost production above agreed levels. Brent crude LCOc1 was down 0.1 percent at $56.37 a barrel after reaching a five-month high of $56.53 overnight. Asian stocks fell and the Japanese yen and Swiss franc gained on the mooted possibility of North Korea conducting another hydrogen bomb test, this time in the Pacific Ocean.